The Mission Stick, called the Analog Mission Stick (アナログミッションスティック) in Japan, is an analog flight stick for the Sega Saturn. The Mission Stick comes in two parts - a large flat unit featuring the usual Sega Saturn buttons (with turbo features) and a stick unit, complete with a trigger, two other buttons, and a throttle wheel. The Mission Stick is unique in that it can be "flipped" to suit both left handed and right handed players player - the flat "control panel" unit connects to the Saturn console, but the stick unit is detachable and can be inserted at either side (this connects to the flat unit via a "main control" port located at the base of the unit). This "control panel" base unit has all nine regular Saturn buttons on it, including duplicates of the three on the stick. The base also has individual turbo switches for each button. The Mission Stick was designed designed primarily for flight and 3D shooting games, though it is compatible with the majority of Saturn software because it can also work in a digital mode. Unlike the 3D Control Pad, the Mission Stick does not have a switch to switch between modes; instead, the stick will be proportional in games that support analog, or digital in games that do not. 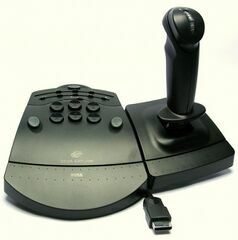 Like with the Arcade Racer Joystick, most games which support the Mission Stick also work in analog mode on the 3D Control Pad. The Arcade Racer Joystick and Mission Stick each have several games that only work in analog on that specific controller, but most work on both, and on the 3D Control Pad as well. However, the throttle wheel on the stick is not supported by other controllers. The throttle wheel is only used in a small number of the games though, and in some cases, such as MechWarrior 2: 31st Century Combat, native 3D Control Pad support avoiding the wheel is still an option. Others such as Black Fire are only partially-compatible with the 3D Control Pad in analog mode due to a reliance on the throttle. Interestingly enough, there's an expansion connector on the bottom of the stick labeled "sub control", which was given no official use. However, this can be exploited through a second Mission Stick to access a hidden function of the controller. Mounting two sticks to the control panel at either side, where one uses "main control" and the other "sub control" will create a "twin-stick". Only one game, Panzer Dragoon Zwei, is known to support that twin-stick mode, and it is important to note that the Mission Stick in twin-stick mode is not compatible with the Saturn Twin Stick, which is an entirely separate control scheme. The Mission Stick was also one of the more expensive Saturn control peripherals, and (as far as Japan goes) very few games supported it, however, most games which support the Arcade Racer Joystick in analog mode will also support the Mission Stick in analog mode. In western markets some games such as MechWarrior 2: 31st Century Combat and Panzer Dragoon function with the Mission Stick, even though the information is missing from the packaging, so its library isn't quite as small as it may appear to be. Because of design differences from the regular digital control pad, not all games will recognize the Mission Stick, such as Tunnel B1 or Bulk Slash. Furthermore, certain games, such as Solar Eclipse will ignore custom button configurations. Also of note is the type of connector used by the "main control" and "sub control" ports - it is a DE-9 connector, used for previous Sega consoles. In Japan, the controller has model number HSS-0114 and was released on 29 September 1995 and retailed at ¥7,800.